Although she wears a variety of hats in her role as vice president and executive director of UT Le Bonheur Pediatric Specialists, Shannon Tacker, CPA, makes sure each one of them is dedicated to her prime directive: ensuring that every child has access to the care he or she needs. "It shouldn't matter whether they're commercially insured, uninsured or insured by Medicaid; every child deserves the best care, and we're committed to making sure they have that access," she said. To that end, since 2012 she has been establishing and building the specialty physician group that was created in 2011 as a joint venture of Methodist Le Bonheur and the University of Tennessee Health Science Center. Its objective, to "really create an avenue for excellence in pediatrics in the Mid-South," has been demonstrably and dramatically realized. "We started off with about 90 physicians in 2011, and as of this month (August), I think we're up to 220 providers," Tacker said. The growth on that initial investment has allowed the group to recruit nationally renowned physicians -- and retain them. She points to pediatric cardiologist and cardiac researcher Jeffrey Towbin, MD, a world-renowned pioneer in the field who heads Le Bonheur's Heart Institute, and James Wheless, MD, a pediatric neurologist who directs its Neuroscience Institute and Comprehensive Epilepsy Program, along with other exceptional leaders in much-needed specialties. "People come not only from the United States but internationally as well to see the physicians in our Memphis backyard," she said. "All of our providers are employed by the practice plan as well as UT, so they all have academic appointments. Research is in their blood, so we're always looking for the next new treatment or cure." Strides have also been made toward making those specialists and services accessible to more children. The Le Bonheur Children's Outpatient Center in Tupelo celebrated its expansion in July, doubling its previous size to 12,000 square feet and now housing eight specialty clinics -- in allergy, cardiology, gastroenterology, nephrology, neurology, neurosurgery, pediatric surgery, and pulmonary care -- plus lab, X-ray, ECHO, EEG and pulmonary function testing. Another center is under construction in Jackson, Tennessee, and will offer similar specialty and ancillary services when the new 30,000-square-foot facility opens in early 2018. "We're really excited about that," Tacker said. "You'd be surprised at the number of kids who travel hours to come here (to Memphis). These regional locations make it much easier on the families, who don't have to travel as far. And some kids who couldn't get here at all can now get the care they need." She hints, too, at potential future development in Arkansas, describing an existing smaller clinic in Jonesboro. "I think there's a possibility in the future that that could increase in size as well," she said. These significant strides in growing the specialty physician group and expanding regional pediatric centers of excellence have not gone unnoticed. In June, Le Bonheur was not only named a Best Children's Hospital for the seventh consecutive year by U.S. News & World Report, this year it also received recognition in eight specialties: cardiology and heart surgery, gastroenterology and GI surgery, neonatology, neurology and neurosurgery, nephrology, orthopedics, pulmonology and urology. "This makes us very proud," Tacker said. "But there's always room for improvement; we're always expanding and always moving forward." 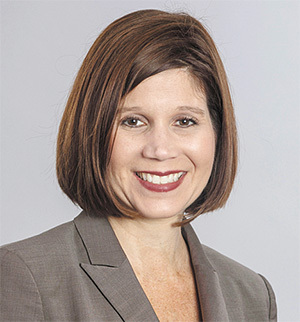 A former CFO for the Baptist Medical Group, Inc., Tacker has also previously held two vice presidential titles with UT Medical Group during her 20-year history in healthcare administration, where her financial background gives her a significant edge -- especially in these troubling times of shrinking reimbursements and essential cost-cutting. "Despite decreased reimbursement, we continue to focus on quality and on the programs that have the most impact," she said. "All of our programs are considered centers of excellence and are top-notch." The challenge now is sustainability. "What this region has in Le Bonheur is amazing, and I think the community knows that," she said. "They're very supportive. But I consider it part of our job to make sure that 5, 10 and 20 years down the road, Le Bonheur is still here and we're able to provide these services to the kids. That's the most important goal for us." Tacker acquired her hands-on familiarity with the medical field at age 14, working with her father in his family practice near Jonesboro. When she migrated to Memphis as a CPA, her first job was in healthcare. "Even though I'm a numbers person, I really like to understand the operations behind it, so I was always very willing to learn new tasks, and employers would place me in areas that were 'broken' and needed to be fixed," she recalled. That knack for troubleshooting opened operational doors for her. "I was always open, and I moved a lot within each organization." Each move brought the opportunity to learn and expand her competencies in new areas. Regarding that unusual career path, "It wasn't planned," she said, "but I love what I do. And I'm very thankful because at this point in my career I have something that not everybody has -- I have the finance background, but I also have an operational background, too. "People who work at Le Bonheur are a very passionate group who love to take care of kids, so my job is easy," she said. "Walking through the halls, going over in the clinics, rounding on kids in the hospital, you recognize that these are sick kids, and these are families for a lot of whom this is the last resort. I don't know that I have ever been as fulfilled in a position as I am here; every day is a good day." Tacker, an avid reader, has three children, ages 8, 11 and 18 -- who are "always top priority"-- and five horses, which her husband and daughter ride in endurance competitions.